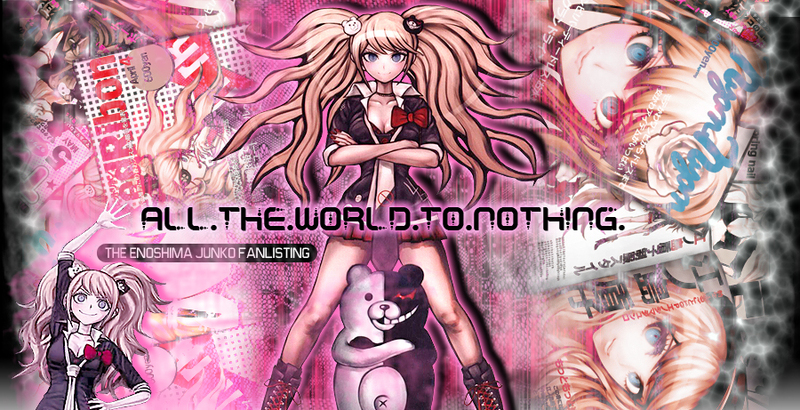 You reached All the World to Nothing, the fanlisting dedicated to Enoshima Junko, a character of the series Danganronpa Kibou no Gakuen to Zetsubou no Koukousei! 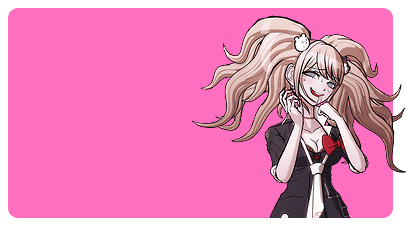 To me, Junko is the perfect antagonist. She's desperately desperate, crazy and evil. But her evilness is different from the ones of the other canonic masterminds. She is the kind of person that sold everything she had, careless of what could happen if she was really happy with another lifestyle. She started a proper and real revolution, she made a new world that's not relly a good world, but surely is something new. The love she proved for her sister was something I felt terribly near mine for my sister, and I'm happy that I was not left alone as she, unfortunately, was. I think that her madness started in that moment, where something she cared a lot disappeared from her (already sad) life. She is inclined to destroy what she loves and what she likes, and this is the base for the despair she adore this much. Though at the begin I couldn't believe my eyes when I knew her real self and I kinda despise her for what she had done; I started to see her from another point of view, trying to understand why she had done all that mess. This introspection lasted a lot of time in my mind, and at the end I really don't know if I found the real reply to my question, but I hope so. Anyway, she's one of the most charismatic characters, and being crazy affects even her personality both as Monokuma and herself. She's adorably unstable, but at the same time she has the mind of a real evil genius and I totally adore that part of her. I was a bit shocked at the end of the story, but still... it could be predictable since what she wanted was suffering. I definitely think that she's really the pillar of the story because she created everything and it is that everything that let the story going on.